Ayatollah Seyyed Ali Khamenei, the Leader of Iran’s Islamic Revolution, has lauded the peaceful coexistence of Shiite and Sunni Muslims in Iran, describing them as a role model for all Muslims in the world. In comments released on Tuesday, Ayatollah Khamenei said the Sunni-majority provinces of Sistan and Baluchestan in the southeast, Kurdistan in the west, and Golestan in the northeast are symbols of Muslim unity and a role model for cooperation and brotherly coexistence of Shiite and Sunni brothers in the world. 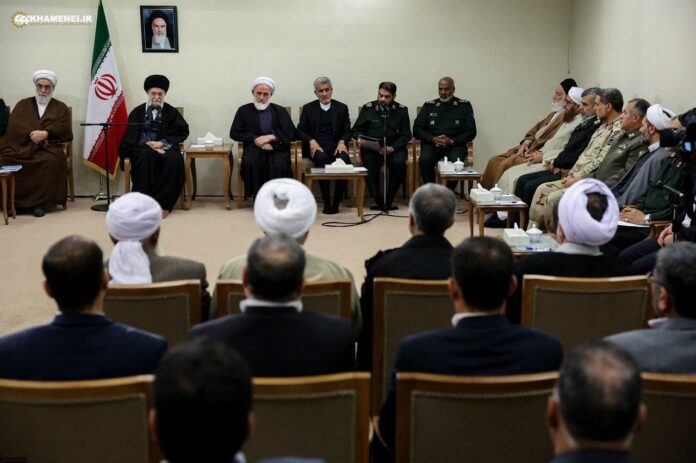 Addressing a group of people from Sistan and Baluchestan province, Ayatollah Khamenei said the martyrdom of a Sunni teenager during the eight-year war imposed by Iraq on Iran, or the martyrdom of a Sunni cleric while defending the Islamic Revolution against the counter-revolutionary forces, indicate that Shiite and Sunni brothers in the Islamic Republic come together in the most difficult situations. The Leader further expressed his great love for the people of Sistan and Baluchestan, and described the Baluchis as a friendly, sincere, and talented people with a brilliant and unique history compared with other Iranian ethnic groups. “Despite such abundant capacities, the people of Sistan and Baluchestan were ignored during the Qajar and Pahlavi dynasties, and this kept them from flourishing,” he added. The Leader urged the provincial officials to seriously follow up fulfilling the people’s needs in this region, including water desalinating facilities and railway system, and asked them to tap into the potentialities of the private sector while using the resources of National Development Fund. Sistan and Baluchestan is the second largest province in Iran (after Kerman Province), and shares borders with Pakistan and Afghanistan. The population comprises the Baluch who form a majority in the province, followed by the relatively large minority, the Sistani Persians. Baluchis are predominantly Sunni Muslims. Sistanis, however, are predominantly Shiite Muslims. The province today is the most underdeveloped, desolate, and poorest of Iran’s provinces. The Iranian government has been trying to reverse this situation by implementing new plans such as creating the Chabahar Free Trade-Industrial Zone.